Crowds gather early in the morning to watch for what the future will bring. The media are on hand for the latest predictions and run stories with sensational headlines to engage their audience. Men in coat and tie confer, hoist prominent prognosticators on high and loudly sing praises about their ability to predict the future. Beyond the Punxsutawney Phil ceremony illustrated in the picture above, what I was just describing doesn’t just happen on Groundhog Day. It happens every day on Wall Street, with its endless daily stream of chatter about morning futures and estimates about the direction of the financial markets. Unfortunately, research suggests that the wizards of Wall Street often have about as much predictive power as the Wizard of Oz and as much success in predicting the future as groundhogs. 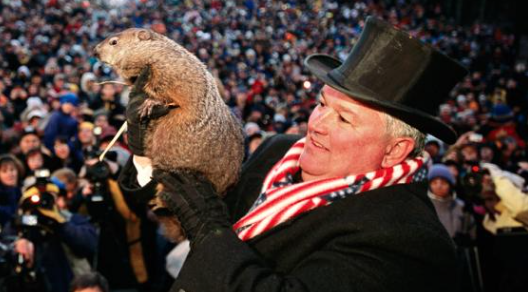 Just as it is might be hard to resist clicking on stories about Punxsutawney Phil and predictions of warmer Spring weather, it is hard to avoid getting caught up in the emotion and allure of economic and market predictions. As many researchers have shown, our brains have evolved to recognize patterns. This ability kept us out of trouble on the plains, but the side effect is that we are pattern junkies. We are naturally inclined to search out patterns and to try to use them to predict the future. Unfortunately, this makes some of us think that we have crystal balls and makes us all vulnerable to the psychological bias known as the halo effect. The better known, more intelligent, better looking, or more respected an expert forecaster is, the greater the confidence we have in his or her predictions. Unfortunately some of our most haloed luminaries, such as even Federal Reserve Governors and their economists are poor soothsayers (see the bottom of this article for related posts and research). Yes, you read this correctly, they predicted the downturn only after it started and the recovery only after it began. My halo bias wants to believe this, but independent analysis of investment analysts’ estimates and projections paints a consistent picture. They are also often wrong at the wrong time. The chart below is from the most recent 2010 McKinsey & Co. research paper. 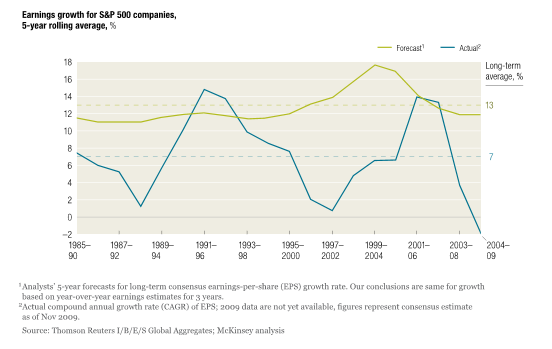 The light green line represents Wall Street earnings forecasts. The blue line reflects what actually happened. Like Bill Murray during his Groundhog Day movie experience, surely we’ve finally learned something during the last financial crisis and are not repeating things over and over the same way. Just as recent experience has shown weakness in political predictions, research on the accuracy of investment estimates continues to disappoint. CXO Advisory recently published a report based on over 6,500 predictions made by 68 investment gurus covering the time period 1998 – 2012. What did they find when they graded these gurus? The accuracy of well-known investment strategy professionals, including luminaries like Jeremy Grantham and Abby Joseph Cohen, was only 47%. Yes, worse than a coin toss (see the following for the complete study – Guru Grades). Evidence suggests that market predictions aren’t worth much, but this doesn’t mean you should go into an investment hole during difficult, wintry market conditions. If you have spent time developing a long-term plan based on your goals, and not the models of others, stay on course, or as we wrote about before, just Keep A Steady Hand On The Tiller. Rough market shadows can make everyone feel like a groundhog, but remember that market troubles eventually thaw, and that steady long-term investors are consistently rewarded.